The Sumitomo Cyclo drive is unsurpassed by any other inline drive available in the market today. Cyclo’s unique epicycloidal design has advantages superior to speed reducers using common involute tooth gears. Cyclo components operate in compression, not in shear. Unlike gear teeth with limited contact points, a Cyclo has two-thirds of its reduction components in contact at all times. 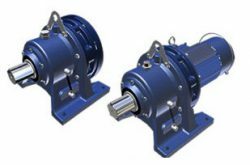 This design enables Cyclo speed reducers and gearmotors to withstand shock loads exceeding 500% of their ratings, and provide exceptional performance, reliability and long life in the most severe applications. The key to Cyclo’s matchless performance and reliability is that 67% of the reduction components are in contact at all times, compared to geared designs that use only limited tooth contact.